If you know what InteractiveX is, AmpReactor matches the InteractiveX philosophy closely, really only straying significantly for the binding operators. If, alternatively, you know what ReactiveX is, InteractiveX is the "pull" analogue, where enumerables take the place of observables. If you know about AmPHP's Iterator, AmpReactor lets you clone, reduce and expand async Iterators, and lets you enforce precise policies on buffering. //  the iterating scope is in full control. This library is something of a language port of HHReactor, the original implementation of this functionality which was written in Hacklang. In replacement of Hacklang's built-in async, this library builds on the Amp concurrency framework. Amp allows one to write asynchronous code without callbacks in PHP by carefully controlling generators and interfacing between these generators and PHP event loop extensions. This way, async and sync code can blend seamlessly, and in similar spirit to Hack async, a lot of idioms from the language itself are preserved for async behavior. Foremost, AmpReactor diversifies the backpressure options to match those in InteractiveX: Share, Memoize and Publish (described later). This way, iterators are no longer limited to one consumer at a time. Many consumers potentially means many useful forms of the same iterator, so built into AmpReactor are almost all of the ReactiveX/InteractiveX operators. Most of the operators match the canonical InteractiveX/ReactiveX signatures. The quickest way to scan the signatures is to look at the reference documentation. "Binding" operators – share, memoize, publish: these are replaced by cloning. defer operator: no strong motivation to implement it. [Ix's Memoize & Publish] If the InteractiveProducer is cloned, the buffer is also cloned, so consumers will receive the same elements from the moment of cloning. In this way, clones act like InteractiveX's Memoize and ReactiveX's Replay. To emphasize: the clone doesn't see any elements produced by that InteractiveProducer before the clone exists. In this way, Memoize and Publish behavior differ only in when/of what the consumer takes a clone. Cloning from a InteractiveProducer that is never iterated will give Memoize behavior. Cloning moving InteractiveProducers will give Publish behavior. Note however that, because the consumer is in control of iteration, the underlying iterators aren't started until the first clone requests the first element. Behavioral Note: as will be mentioned below too, the buffer is managed like Publish rather than Memoize. InteractiveProducer is very straightforward with deciding which nodes are reclaimed because it relies on the garbage collector: once the laggiest consumer advances, the node is reclaimed. It is then a simple and explicit matter of keeping or not keeping unstarted InteractiveProducers, which will or won't hold elements from the very beginning respectively. [Ix's Share] If the InteractiveProducer is not cloned, consumers all share the same buffer, and hence they compete directly for values. Behavioral note: All operators implicitly clone their operands to avoid competing with other operators or raw consumers for values; they all implicitly Publish. The producing and consuming timelines are separated by a buffer, and if not paused, the underlying iterators don't wait for consumption. That is, once started, they will run and push to the buffer even in the absence of a matching stream of advance calls. As a result, iterators can run as quickly as possible, and memory can be controlled by managing references and sharing behaviors. Generally, InteractiveProducer relies on the garbage collector to clear the buffer it accumulates from differences in consumption rates between consumers. 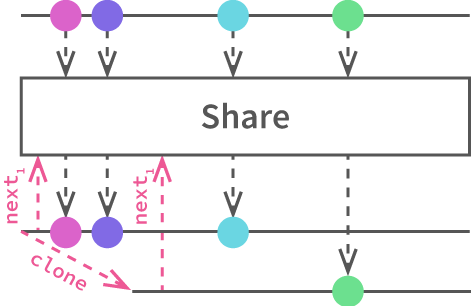 As the laggiest consumers step their way through the buffer, their references to the earliest nodes of the buffer linked list are shed and the garbage collector clears these unreachable nodes. You can stop consuming from a InteractiveProducer in a few ways, each with different consequences for resources. Just drop all references to it, and free resources as quickly as possible. This includes all clones and all InteractiveProducers that come from operations on the InteractiveProducer of interest. Drop only the running instances/clones, and stop consuming resources quickly, but maybe restart later. Has next ever been called on it, its clones, or InteractiveProducers coming from its operators? Other InteractiveProducers (e.g. are they results of operators on other InteractiveProducers)? When the first item is requested from a InteractiveProducer, it begins "running". Each InteractiveProducer knows the number of running clones. detaching a running InteractiveProducer decrements the running count. See 1. InteractiveProducer::_attach(); 2. BaseProducer::running_count, BaseProducer::this_running, BaseProducer::some_running; 3. InteractiveProducer::_detach; 4.1. InteractiveProducer::iterator_to_emitting_generator; 4.2. InteractiveProducer::_detach. *A InteractiveProducer knows it holds running references to all of its children because, as part of its attachment routine, InteractiveProducer must start iterating them all.